They announced at the top of the show that a contract signing between Nia Jax and Ronda Rousey for their match at Money in the Bank will take place tonight. Kurt Angle started things. He announced a Fatal Four-Way Ladder match before Stephanie McMahon came out. No cast on her left arm to sell the beating by Rousey, which she emphasized as she came down the ramp. McMahon said everything that happened at WrestleMania is now water under the bridge. She said she's a leader and she will always do what's best for business. Fans chanted "you tapped out," which she admitted to doing. McMahon said with her guidance, Angle could improve as an GM. Stephanie said sometimes Angle lets his emotions get in the way and she will preside over the contract signing between Jax and Rousey. Angle said he agreed with Stephanie that he could use more guidance. Stephanie said Angle has given Roman Reigns too much latitude and that should end tonight. Reigns came out to mostly boos. Corey Graves bellowed "What a reaction!" Reigns said if Stephanie was going to say something about him, say it to him. Stephanie said she didn't understand Reigns temper as of late and if he can't contain his Samoan temper, then maybe he can look for another line of work. Reigns said Stephanie should watch her tone when she talks to him. Reigns threatened to take his temper backstage and destroy all of her favorite superstars. Stephanie said she doesn't have favorites, she does what's best for business. She said she manages revenue streams and handles amount of money that these people can't begin to imagine. Reigns wanted to talk about Stephanie's favorite line of revenue, Brock Lesnar. Stephanie said management has heard Reigns' complaints about Lesnar and has taken it under advisement. Reigns told Stephanie to cut the line of corporate crap and start being honest. Reigns said the fact is that management doesn't want him anywhere near the Universal Championship. Stephanie said the truth is Reigns lost his qualifying match and if Reigns wants to take it up with someone, take it up with Jinder Mahal. With a smirk, Reigns said he already did. Owens said he almost feels indebted to Reigns for spearing Mahal through the wall, because he grabbed the brass ring and earned a spot in the Money in the Bank match. Owens said everyone knows that what's best for business is him winning the Money in the Bank contract. Owens said he actually he really likes Reigns, and said the crowd likes to chant stupid stuff and tried to get a "Thank you, Roman" chant going, but they wouldn't follow. Owens said he tried. Owens said Stephanie was right when she said she doesn't play favorites. Even though Owens had issued with her father and her brother, she still hired him to be the cornerstone of her Monday Night Raw roster because it was best for business. Owens touched Stephanie on her shoulder. Stephanie barked at him never to touch her again. I guess because Owens touched her, Stephanie ordered Owens to face Reigns immediately. Owens looked confused over that but Reigns looked happy. Reigns largely controlled the action for the first five minutes until he missed a Drive-By, and Owens countered with a kick to the face. Reigns made his comeback after a series of clotheslines. Owens responded with a DDT for a two count. Owens went for the Pop-Up Power Bomb, but Reigns kicked him in the face and hit a Samoan Drop for a two count. Owens sidestepped the first Superman Punch with a schoolboy cradle for a two count, then nailed a superkick. Reigns landed in the corner and Owens tried the cannonball, but Reigns laced with a Superman Punch for two. Reigns called for a spear, but Owens rolled out of the ring. Reigns speared Owens on the floor. Mahal ran out and jumped Reigns on the floor. Mahal, who had his ribs taped, threw Reigns into the dasherboards and put the boots to Reigns. Owens joined in and put the fists to Reigns. Seth Rollins ran out to clean house on Reigns, Owens and Sunil Singh. This led to a tag team match supposedly ordered by Angle during a commercial. Reigns got the heat. Just as Reigns was set to make a hot tag, Mahal pulled Rollins down from the apron and threw him into the barricade. Owens leveled Reigns with the cannonball for a near fall. Reigns made the hot tag after kicking Owens in the head after he made another attempt at the Pop-Up Power Bomb. Rollins hit Mahal with a sling blade and clotheslined him over the top rope, then caught Owens with a tope, followed by a tope for Mahal. Rollins got a two count on Mahal following a blockbuster. Singh jumped on the apron to distract Rollins, and Mahal hit a fireman's carry into a double knee gutbuster for a near fall. Owens tagged in and deliver another gutbuster, followed by a inverted second rope elbow drop. Reigns ran back in for a Samoan Drop. Good finishing sequence where Rollins escaped the Pop-Up power bomb from Owens, missed the first Stomp but hit the 2nd attempt to pin Owens. As Rollins posed at the top of the ramp after the win, Mahal ran back out and slammed Rollins in the back with a chair. Mahal jabbed Reigns in the midsection with the chair and slammed him across the back. Mahal leveled Rollins in the back with a chair, then hit Reigns on his back several more times. Mahal gets solid heat. Rollins and Reigns were helped up by various referees to cheers, but then they played Reigns music and everyone booed. Reigns vs. Mahal is official for Money in the Bank. Zayn came out for the Lashley sisters segment. 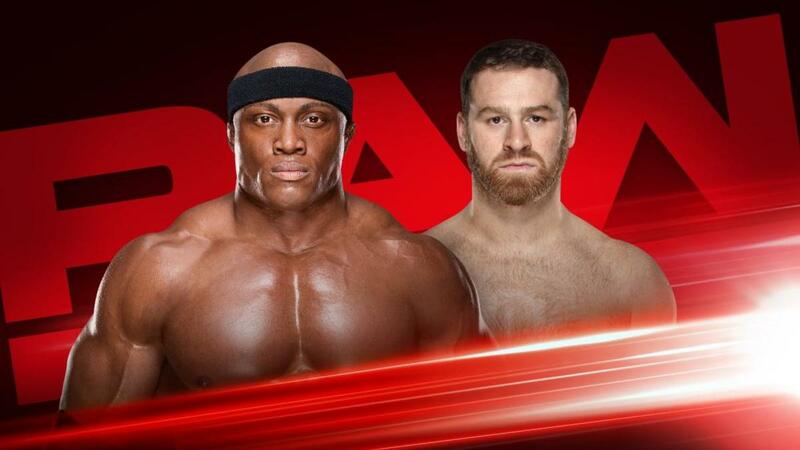 Just before this started, Michael Cole led into a replay of Lashley's interview with Renee Young from two weeks ago and said Lashley discussed his four sisters. After the break, Graves brought up that Lashley actually had three sisters. Cole's tone of voice in admitting his mistake sure sounded like he caught hell during the commercial. Zayn said everyone saw that special interview where Lashley proclaimed his love for his sisters wasn't entirely accurate. Zayn said he was expose Lashley and his lies. Zayn brought out the Lashley sisters, Franics, Cathy and Jessica. The sisters were three men in drag, including one who had a mustache and another in a blonde wig. Crowd was deathly silent. Zayn turned to Cathy, who was carrying a broom. Cathy explained that she carried the broom because when she and Bobby were younger, Bobby was mean to all of them, especially her. So to defend herself, she grabbed the closest thing to her, her mother's broom to swat that "snarly menance away from her." The groans and boos started here. Frances, the sister with a mustache, carried a helmet around. She explained she carried her helmet because Bobby would hit her on top of the head with his knuckle. Frances save up enough money to buy a helmet from the local Army/Navy store. Jessica hauled around a towel and said Bobby would hurt her feelings. He made her feel so bad she would cry so much, a tissue wasn't enough. He made her cry so many times, by the end of the night, the tower was "sopping wet." Cathy said Lashley only loves himself. Zayn asked Frances how their parents felt about Bobby. Frances said they had to ship him off to reform school. Zayn asked how the community felt about Lashley. Jessica said Bobby was a thief and the local store owners would call the cops on him. Zayn said this proved Lashley is a liar, a thief and a juvenile deliquent. At long last, Lashley came out smiling to no crowd reaction. Lashley tried to crack jokes about how he couldn't believe Jessica (with a blond wig) was still single. Lashley said that Frances had something that so many other women had what other women wanted to have, a big, hairy mustache. Lashley sarcastically thanked Zayn. Zayn said maybe Lashley would like it more if he Helluva kick'd Lashley now and threw him out of the ring like garbage because that's what Lashley's family thinks of him, they think he's garbage. Lashley wasn't smiling anymore and went after Zayn, but Jessica grabbed Lashley and his three "sisters" joined Zayn in going after him. Lashley made his own comeback, laying out Zayn, Jessica, Cathy and Frances. As if this segment wasn't horrid enough, Lashley put the helmet on Frances, then hit Frances on top of the helmet. Yet Frances still sold it. Cathy was thrown into the top rope, then over it. Jessica took a choke slam. Lashley crotched Cathy with the broom and sent him over the top rope. Cole said "I don't think Zayn is going to win a Murrow Award after that." It was as bad as everyone feared. Alexa Bliss did an interview with Young, who brought out Ember Moon beating Bliss in a tag team match after WrestleMania. Bliss brought up 410 A.D. Rome, where Visigoths destoryed the entire city. The Visigoths had the element of surprise. Bliss said when Moon beat her, she didn't know who Moon was. Tonight, she will beat Moon. Moon missed a baseball slide to the floor and Bliss gave her a twisting armlock into the boards. Bliss held an armlock until Moon hit a side slam. Bliss grabbed the apron into the ring, leading to the referee turning his back. Mickie James ran in the ring and took off one of her high heels. The referee turned his back, caught James in the act and ejected her him ringside. Moon kicked James out of the ring. Bliss tried to pin Moon with a schoolgirl crable while holding the trunks. Moon kicked out, kicked Bliss across the chest and pinned her with the Eclipse. Stephanie took over Angle's office. Finn Balor and Braun Strowman came in. Balor asked Stephanie for a rematch from last week where they could face Dolph Ziggler and Drew McIntyre. Stephanie said that Balor and Strowman aren't really a team. In fact, some may say that Balor could blame Strowman for their loss last week. So instead of Balor and Strowman teaming together, they would face each other tonight. Strowman took an apple that was on Stephanie's table and crushed it in front of Balor's face, telling him "I love competition." Balor looked horrified. Baron Corbin threw No Way Jose shoulder-first into the post. Jose responded by throwing Corbin into the post. Jose made a comeback with a clothesline and Evil's Darkness Falls for a two count. Jose teased the Windup Punch, but Corbin caught him. Jose tried to pin Corbin with a schoolboy cradle, but Corbin caught him with the Deep Six and the End of Days. Angle was in the middle of a hallway. He emphasized that Stephanie took over his office. Chad Gable walked up. Angle said he wanted Gable to replace Mahal in the Money in the Bank qualifying match last week, but management had other ideas. Ziggler and McIntyre walked in. Ziggler walked up and laughed about how Angle was kicked out of his own office. McIntyre talked about beating Balor and Strowman last week and they would love to do it again, but from what they here, that decision is about Angle's pay grade. Ziggler said Gable's claim to fame is that Gable was a great amatuer wrestler. Ziggler told Gable he doesn't sit around waiting for a handout. Gable got in Ziggler's face. Angle said they would settle this in the ring tonight. Tyler Breeze and Fandango did an interview showing off their new t-shirts. Bo Dallas was still filling in the "B" on Curtis Axel's t-shirt with a magic marker during their ring entrance. There are already fans at ringside wearing "B" on plain, white t-shirts. Axel pinned Fandango with a reverse 3-D. Dallas and Axel fell over themselves celebrating. They even went to the commentator's table, where Dallas went out of his way to shun Jonathan Coachman. Axel and Dallas mobbed Graves, however. Dallas grabbed the commentator's chair and Axel jumped into his arms, riding down the ramp together. Somehow, the chair didn't tip over until they reached the bottom. That was almost certainly the most impressive thing that's happened tonight. Stephanie was in the ring for the Rousey/Jax contract signing. As Jax came out, Stephanie was wearing heels that let her stand nearly eye-to-eye with Jax. Rousey asked Stephanie about her arm. Stephanie said her arm was well, thanks for asking. Stephanie asked Rousey how it felt to leap frog the entire Raw's women's division ahead of women more deserving ahead of her. Rousey reminded Stephanie that Jax challenged her. Stephanie said that Jax was trying to make herself a name at Rousey's expense. Stephanie dominated the talking in this segment, saying that Rousey has never competed in a singles match and that she was ripe for the pickings. Stephanie also said that Rousey comes from a land of flyweights and bantamweights, and there is no weight division in WWE (what is 205 Live about, again?). Nia is bigger, stronger and more powerful than Rousey. Stephanie said Nia knows that Rousey doesn't like to lose. Stephanie said Nia knows that if Jax beats Rousey, then Rousey will tuck tail and leave WWE forever, making Jax the baddest woman on the planet. Stephanie switched ends of the table, not just literally, and said that Ronda know that it took Jax 20 minutes to defeat Bliss, who is maybe one-third of Jax's size. Stephanie wondered why it took so long for Jax to beat Bliss? Stephanie asked why did it take so long to get to this point in her career in the first place? Could it be because Ronday knows the truth, that Jax is lazy? Stephanie went on and on until Jax interrupted her and said Ronda can't get the armbar on her. Jax said she is going to make a name for herself because she's going to beat Ronda at Money in the Bank. They each signed the contract. Then Ronda took the table, pushed it aside and said that she's glad the truth came out. She offered her hand. They shook hands. Ronda said she is going to take Nia's title....and her arm. Stephanie watched this scene with glee as Rousey and Jax had a staredown. Ziggler head butted Gable in the eye and pinned him after a superkick. They had a good scientific match going for the time they were given. Gable gave Ziggler a rolling crotch cradle just before the finish. Postmatch, McIntyre gave Gable a Claymore kick. Natalya won with the sharpshooter. Earlier Natalya went for the sharpshooter, but Ruby Riott got in the ring. Natalya chased her out, but Sarah Logan used a double knee strike. Dana Brooke made the save. Brooke threw Liv Morgan into the post for the fourth time we've seen that spot tonight. At one point, Logan and Morgan teased going at it after they cleared the ring, but just laughed after glaring at each other. Cole built up that spot, then said "I don't know what that's about." Natalya did an interview with Charly Caruso afterward talking about how Rousey is her training partner. She said after Money in the Bank, Rousey will be the Raw Women's Champion and she will be carrying around the briefcase. Elias was in the ring and said since he arrived on Raw, the company's stock has risen 150%. Everyone at NBC/Universal knows that WWE stands for "Walk With Elias." He stummed a song encouraging fans to chant "Yes I do" every time he sings "Do I love Elias?" Just when he seemed to be turning babyface, he went heel again. He talked about being in France last week, so it's crushing to come to a run down city like Albany. Elias won with Drift Away after he crotched Bobby Roode on the top rope. Elias jumped Roode during his ring entrance. Roode went for the Glorious DDT, but Elias turned it into a sunset flip. In order to make sure no one got over in this segment, Elias was plowed over by Strowman on his way to the back. It was every big man vs. smaller man match you've ever seen from WWE. Strowman pounds away on Balor, who makes the inevitable comeback. Strowman went for the wind spring shoulder block on the floor, but Balor met him with a sling blade. Balor dumped Strowman over the top of the barricade, but in a great visual, Strowman arose behind Balor as he was resting. Balor still caught him with a kick. Strowman pinned Balor after two running powerslams.